In this city’s cultural landscape where the major art institutions organize shows around either the experimental or the established, and scrappy grass roots organizations host hooray-for-art free-for-alls, we can forget there’s another option. Often void from the scene are intimate and professionally displayed shows in which a single curator has thoughtfully selected works for the connections and contexts they share. These shows are a labor of love and offer potent ways of experiencing the work that the other formats cannot. 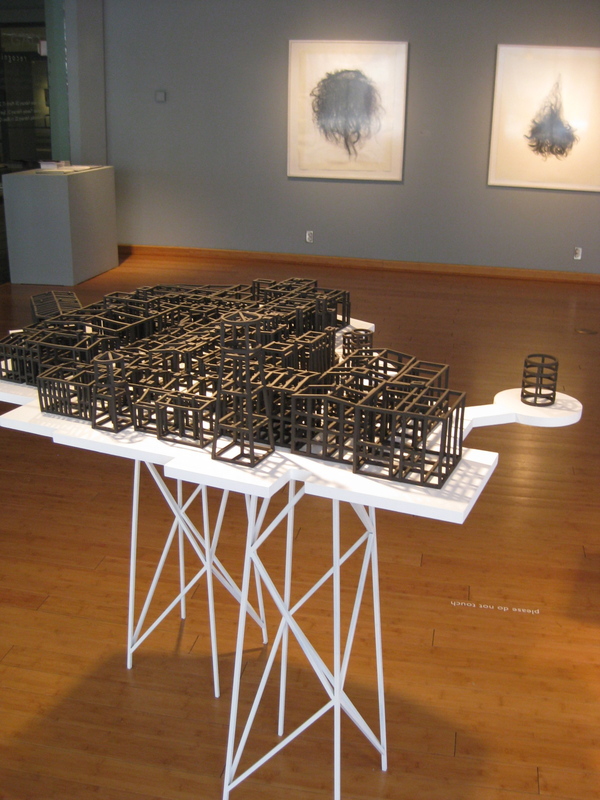 “Acts of Recognition” on view at Kendall College through March 17 is such a show. Curated by Michelle Bosak, the exhibit is an offering of small and heroic acts of grace that perpetuate self-reflection. The show features works by female artists Stephanie Brooks, Anna Campbell, Sarah Lindley, Maureen Nolette, Monica Rezman, Miriam Slager, and Kathie Webb. While Bosak includes only female artists, the show is refreshingly void of overt labels of feminism or forced gender roles. Anna Campbell’s work perhaps deals most directly with gender issues in its examination of the gay liberation movement that came in the wake of the civil rights movement. In her series, “A broken heel, a thrown rock, a movement,” Campbell educates the viewer while deftly subverting societal norms. Campbell pinpoints four bars at the center of the movement, each a gathering place not only for gays but other marginalized groups—transgender individuals, people of color, and the poor. 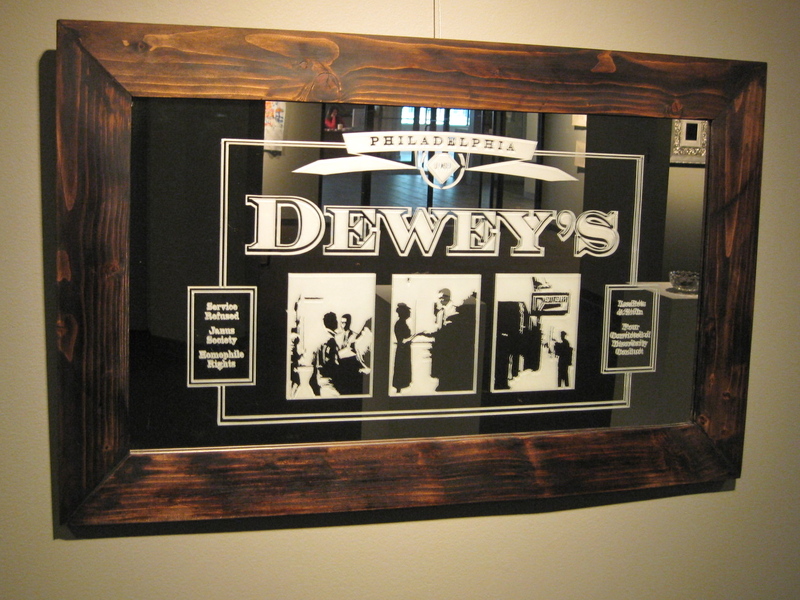 Each bar is represented by a wooden-framed mirror whose surface bears sandblasted images appropriated from newspapers that told these stories fifty-some years ago. Blazoned above the silhouette figures, is the stylized typeface of the bar’s name. The titles read as bullet-pointed lists of issues and events surrounding each pub—for example, “Dewey’s Philadelphia 1969: Service Refused- Janus Society- Homophile Rights- Leaflets & Sit-Ins- Four Convicted of Disorderly Conduct.” The list format of the titles coupled with the appropriated images’ crisp, faceless translation lends charged subject matter a matter-of-factness. Moving beyond the personal, the work demands examination of a larger social context where a new kind of hero—the misfit who frequents the local watering hole in search of companionship– is the catalyst for a burgeoning movement. Gazing into the mirrors, one sees their own image reflected and thus becomes either bystander or participant. Kathie Webb similarly deals with the reciprocal relationship of subject and viewer in her photo series, “Clinton Hill.” The serial images offer an uncomfortable narrative of two presumable sisters gawking at a wheel-chair bound girl who grips a teething ring in her mouth. 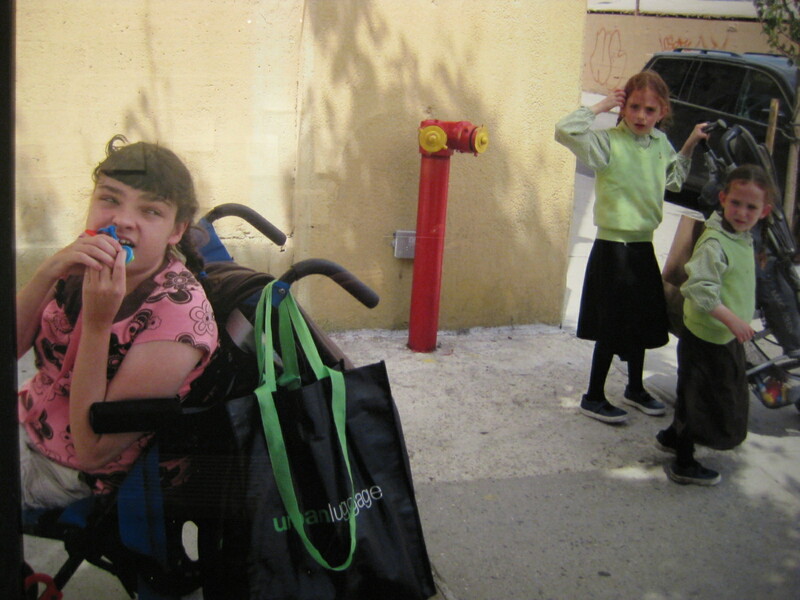 The disabled girl’s body is twisted toward the viewer, and her eyes gradually follow the girls who are pushing a stroller. In the last image, it is unclear whether she is aware of their stares. The absence of any adult presence removes any civilizing forces and we’re met with unmediated reactions of children who test our own sense of appropriateness. As a viewer, you become aware that you too are implicated in this awkward stare-fest. 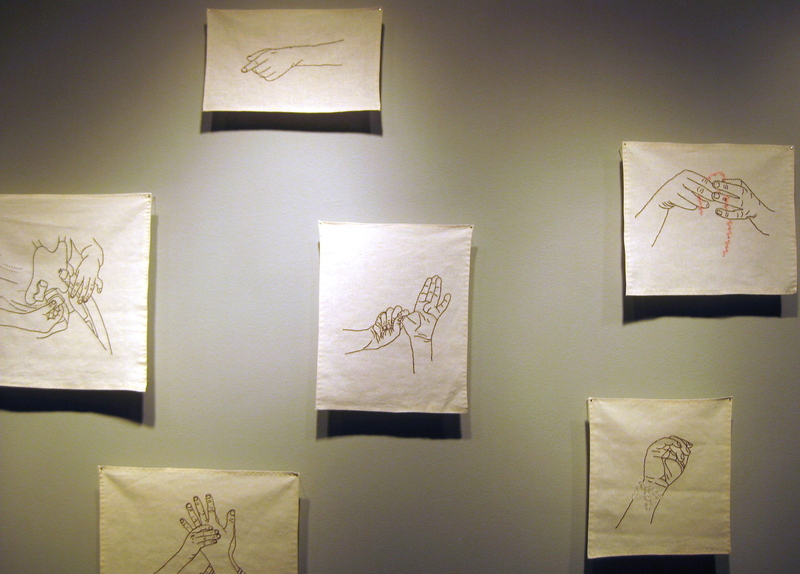 In contrast, Webb’s embroidered series ironically entitled “Verbal 1-10” tears down the barriers of awkward differences in its acknowledgement of the shared language of unspoken gestures. I almost dismissed these hand-stitched drawings out of sheer exhaustion from seeing similar embroidered figurative drawings lately, but Webb’s modest drawings possess a distinct and earnest vulnerability. Tidy stitches on linen lovingly delineate a child’s hands that are at rest, knotted and bent, adorned with a delicate bracelet. In its watchful study and patient documentation, the series possesses a maternal acceptance of both the limits and the profundity of human expression. In a similar nod to both the overt and implied, Sarah Lindley’s work captures the simultaneous presence and absence of landmarks that punctuate her daily commute. Precisely rendered from slabs of black clay, linear geometric repetitions outline the architecture of paper mills and industrial warehouses as permeable, blurring the boundaries of interior and exterior. Although the structures evoke a skeletal, ghostly presence, I find myself more interested in their display than the forms themselves whose tidy exactness seems like a static rendering of an architect’s 3D model. “Abandon” rests atop a cluster of white platforms whose circumscribed shapes trace the buildings’ footprints. The platforms are held up by criss-crossing supports much like the teetering stilts beneath an old water tower. 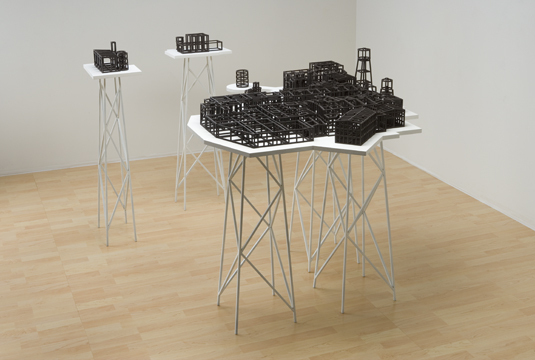 By refusing to ground the work, Lindley transports the forms into the realm of the imagined. In doing so, factories once central to the region’s economy become susceptible to memory’s permeability. Blue-collar industry also factors into Miriam Slager’s work, this time in the form of ephemeral documentation. Slager provides the background/context of free-lance labor in three posters featuring a self-portrait photograph with the text “Slager Cleaning/Interior Painting/ Gardening Services” imposed over her face. By advertising her labor services across her face, Slager embraces the connection to manual labor as a personal one. Most artists who supplement their income with various day jobs disassociate their identity and their art from this reality, but for Slager, this real-world resourcefulness is the crux of her work. She embraces this reality by collecting, sometimes over the span of five years, residue from her various jobs, such as the well-worn sandpaper in “Sanded Papers and Sponges, 2004-2009.” The ephemera serves as a documentation of the artist’s time spent in the service of others, not as one enslaved but as one who cherishes the tangible physicality of her labors. 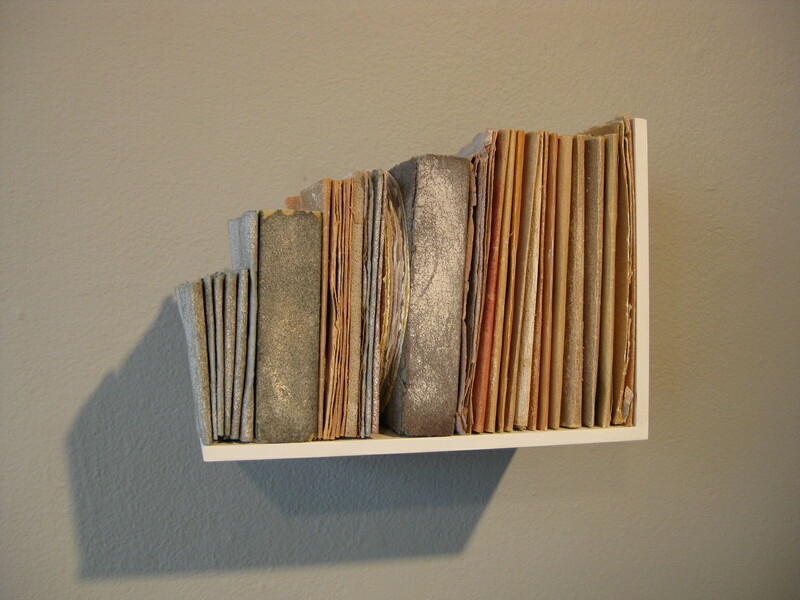 Her careful displays of sandpaper, dryer sheets, and junk mail project from the wall like books that line the compact shelves of a conscientious librarian. In its careful cataloging, the work suggests that all is accounted for; nothing is wasted. In turn, everything is sacred. ← Pattern Show AIGA… and there is happy hour! Wonderful article, a perfectly thoughtful accompaniment to the exhibition. I really enjoyed this show, and having read this I think I might have to go and take another look!! Another facet of Anna Campbell’s works not mentioned about the format is that they echo the beer signs traditionally given to bars to advertise their products, so there is a subtle subversion there as well. I recently discovered that in Michigan, the only kind of beer advertisements allowed in bars are posters and other decorative items like the mirrored signs. Unlike other states where neon or exterior light up beer signs can be quite the norm. This may also note the hypocrisy of Michigan’s bible belt in dealing with issues of GLBT people, where if it is not seen then we don’t have to deal with it.